Is there anything better than hot soup with a nice hunk of crusty bread on a crisp fall night? Last night, I thought i'd make a big pot of french onion soup. 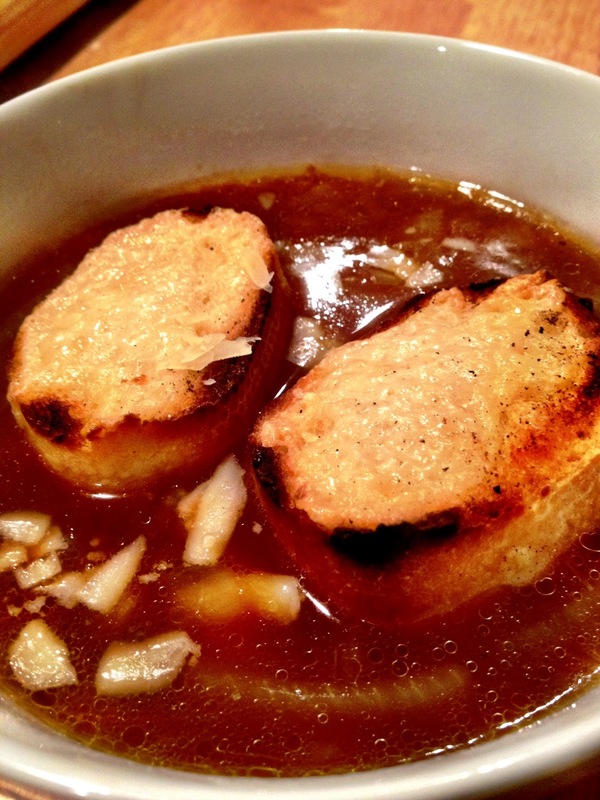 Typically, a restaurant style french onion soup will come in a bowl with the cheese and bread baked right on top. Much to my dismay, I realized when I got to cooking that none of my bowls were oven proof! Since I couldn't broil the whole bowl in the oven, I decided i'd make some cheesy, crunchy toast to float on top of the soup. It was oh so delicious, comforting and best of all, made plenty for leftovers. Melt butter in a large pot over medium heat. Add olive oil to pan and swirl to combine. Add the sliced onions and salt and cook until very soft, about 20-30 minutes, stirring often. When onions are cooked, add flour to pan and stir well. Let flour cook for 2 minutes, then add red wine to the pan. Add beef broth, chicken stock, bay leaf, garlic powder, and pepper to the pan and increase heat to medium high. Let the soup come to a boil, then reduce the heat and let simmer 15-20 minutes. Meanwhile, preheat oven to broil. Slice baguette into individual toasts, place on a cookie sheet, and top with grated cheese. Broil until golden, about 2-3 minutes. Serve soup with toasts on top. Enjoy! Hi Kippy! I'm your newest follower (and would love for your to follow me back!) and fellow port city food blogger. I love love love me some fall soup recipes --I've been trying to challenge myself to make one each week!